Israeli soldiers continued to use excessive force against unarmed civilians and peaceful protestors in the Gaza Strip. 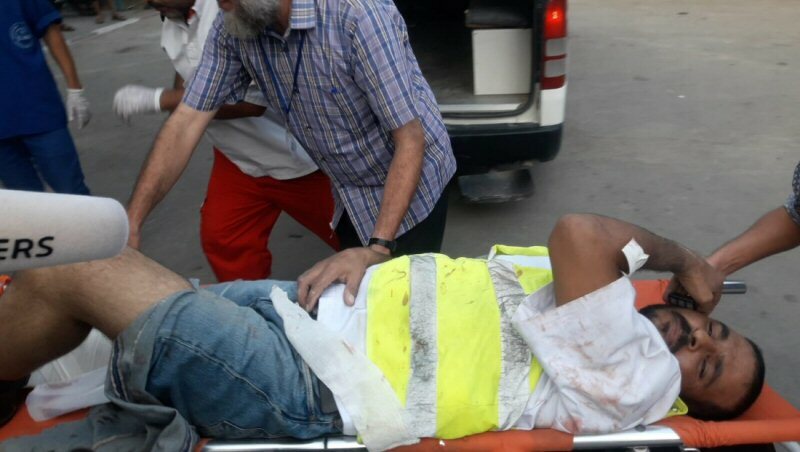 A Palestinian youngster was killed in eastern Deir al-Balah, in central Gaza, while 342 civilians, including 60 children, 4 women, 6 journalists and 3 paramedics, were wounded; 14 of them sustained serious wounds. At approximately 15:00 on Monday, 22 October 2018, Israeli gunboats stationed offshore, and Israeli forces stationed along the border fence between the Gaza Strip and Israel, opened fire and fired sound bombs at dozens of Palestinian civilians who were at the Return camp along the border coastal, adjacent to adjacent to “Zikim” military base , northwest of Beit Lahia in the northern Gaza Strip. It should be noted that this is the 13thtime for Palestinian boats to sail for Breaking the Siege. As a result, 60 civilians, including 15 children, were wounded. Forty six of them were hit with live bullets and their shrapnel and 14 were hit with tear gas canisters. Doctors classified 4 civilians’ injuries as serious. The Palestinians are struggling for survival under the Israeli occupation while the world remains mum over Israel’s unabated terrorism, B’Tselem has warned. Addressing the United Nations Security Council on 18 Oct. 2018, head of B’Tselem, Hagai El-Ad said: “It is very difficult, if not impossible, to fully convey the indignity, the outrage and the pain of a people denied the benefit of human rights for more than fifty years. Here, in these chambers, it is hard to articulate the flesh and blood meaning of the exposed lives Palestinians endure under occupation”, said Hagai. “But no matter how hard it is to describe, the real hardship is that of facing such an intolerable existence day in and day out, of trying to live, and raise a family, and develop a community, under these conditions”, he stated. “It has been almost two years to the day since I last had the honor of speaking before the Council. Two more years of occupation, two years in which the routine of the first 49 years of occupation continued. Since I last spoke here, 317 Palestinians have been killed by Israeli security forces”, added Hagai. “Eventually, what remains are isolated bits, the easier to oppress: a family slated for eviction in the East Jerusalem neighborhood of Silwan; a community such as ‘Urif, south of Nablus, trying against all odds to hold on to its land and farm it in the face of Israel’s long arm of unchecked settler violence; or Area A of the West Bank, conveniently said to be “under full Palestinian control,” but in fact essentially large Bantustans, slowly but surely being hemmed in by ever more new or expanding Israeli settlements,” Hagai’s address read. “For one thing, there’s no argument that the homes were built without permission from the Israeli authorities. But this is the case not because Palestinians are inherently law-breakers, as some in Israel suggest. Rather, it is because they have no other alternative. It is all but impossible for Palestinians to obtain building permits from the Israeli authorities because the Israeli-established planning regime in the West Bank is meant, by design, to serve settlers and dispossess Palestinians,” stated Hagai. “Since March 30, more than five thousand Palestinians have been injured by live Israeli gunfire and more than 170 killed – including at least 31 minors. The youngest were just little boys. Majdi a-Satari, Yasser Abu a-Naja and Naser Musbeh were just eleven years old when they were killed,” B’Tselem’s head warned. “The world must let Israel know that it will no longer stand idly by, that it will take action against the continued dismantling of the Palestinian people,” vowed Hagai.